With the first chill creeping into our days, I am reminded that it must be time for another mystery KAL. I keep reaching for another layer to wrap up in and the Ice Cloud Shawl has become a fast favorite. This shawl, knit with 2 skeins of Fyberspates ‘Cumulus’ and 3 skeins of Stolen Stitches ‘Nua’ (in two colours), will brighten the day in style and softness. If you’re busy planning Christmas gifts (and knitting) this MKAL is the perfect present just for you that will be waiting for you in January when the holiday rush is over. When all the fun is over I love having something special to look forward to. This shawl uses 3 colours; 2 in a sport weight yarn (I used Nua) and one in a fluffy brushed yarn (my choice is Fyberspates Cumulus). 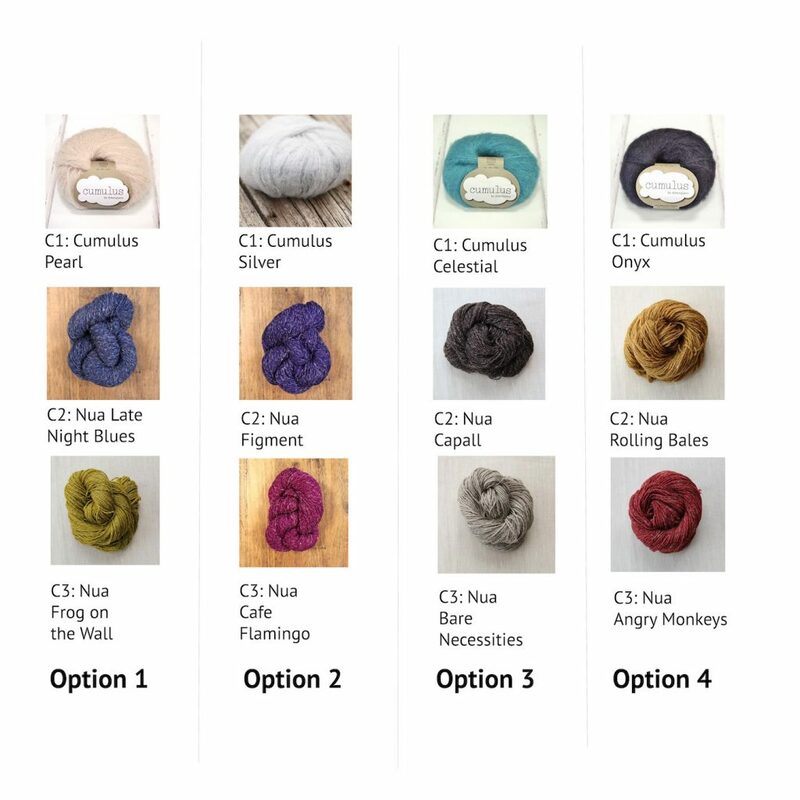 In terms of colour decisions you want C1 (the brushed yarn) to have high contrast with C2 in terms of the colour so they really pop next to each other. Then C3 should contrast with C2. Approximate Yardage: C1: 328 yds (300 m), C2: 276 yds (252 m), C3: 123 yds (112 m). I’ve put 4 kits options together below that I think will work really well together. 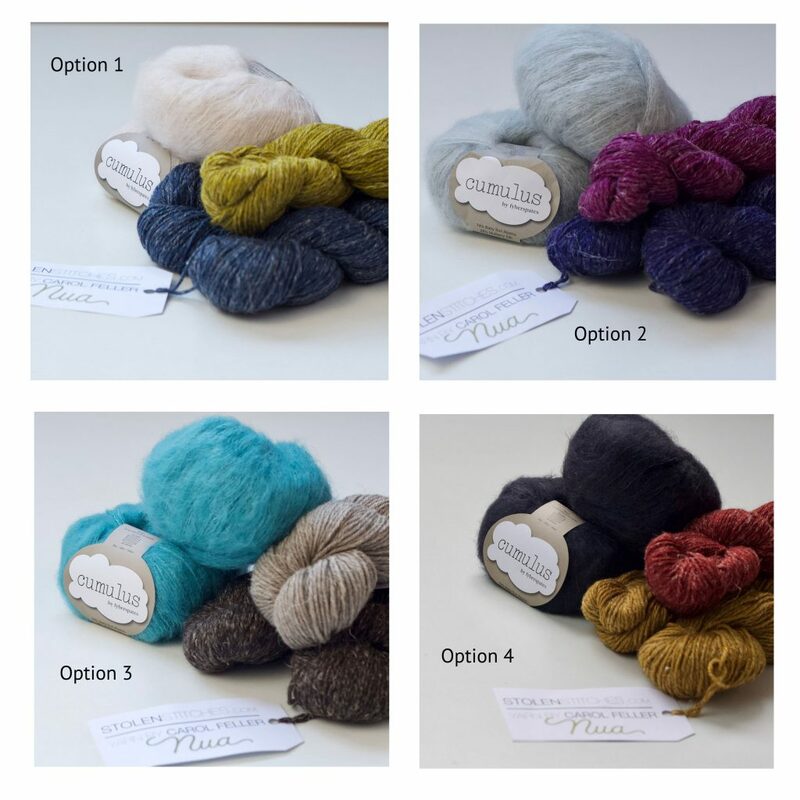 You can also purchase your own choice of Nua here and add it with a fluffy yarn that has got plenty of halo, using my colour choices to guide you. For C1 I’ve chosen Cumulus which is a favourite of mine; it’s a brushed mix of baby alpaca and silk that is as light as a cloud (it’s aptly named!) and is a pleasure to knit with. You can substitute with a mohair or similar blend if you wish also. The kits go on sale on my website at 8PM (IRISH TIME) SUNDAY, 25TH NOVEMBER – That’s at 3pm EST. There will be a raffle drawing in my Ravelry group open to all completed projects with photos in the FO thread. I’ll announce a final prize on 8th February, 2019. If you want to share your progress on social media you can use the hashtag #SSMKAL2019. That way I can always find you! Can you use the KAL image for your first image? That way you won’t spoil the mystery for anyone who hasn’t finished the clue yet. You can do this for ravelry as well on your project page. Feel free to use the image I’ve got for the KAL on the pattern page to keep the shawl a mystery for as long as possible! Please do introduce yourself in the introduction MKAL thread! Did you know that now Stolen Stitches has a Facebook group? There will also be discussion threads for each clue for the KAL on this group. You can purchase the KAL pattern from either my website or ravelry. Remember that you will initially only get an information PDF and the pattern will be released as a series of clues on the dates given. The kits go on sale on my website at 8PM (IRISH TIME) SUNDAY, 25TH NOVEMBER – That’s at 3pm EST. 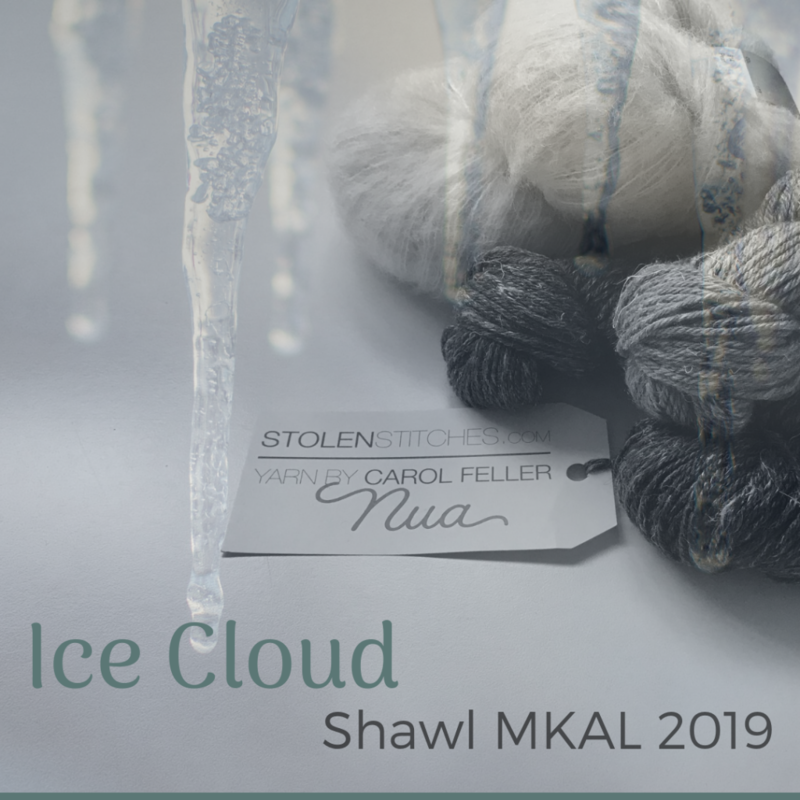 The kit includes 3 skeins of Stolen Stitches ‘Nua’ in 2 colours and 2 skeins of Fyberspates ‘Cumulus’ in a single colour. Do you enjoy a good mystery? I’d love if you come and join us, it’s a great way to start off the new year! I look forward to seeing your WIPs and FOs. What skill level is the pattern written for? I ordered my pattern from your website along with a yarn kit. Is it possible for me to receive updates for the pattern on Ravelry. I like having my patterns in one place for convenience and had not thought carefully about it before ordering.. if there is something I can do, please let me know. The kit is for yarn only so the pattern does need to be purchased separately. Yes of course you can have it added to ravelry, just send me a message through the contact form with your order number and your ravelry name. Hello Carol. I am allergic to alpaca and mohair (isn’t that sad?! ), and most wool except merino. Do you have suggestions of fluffy yarn that I could substitute for the Cumulus? Thanks! Hmm – I don’t know of any off hand but maybe throwing a search into ravelry for brushed yarns? Your LYS might be able to help as well I would imagine? I suspect you’d need to go with an artificial fibre to get the brushed look without mohair or alpaca. Do you ship kits to the US? Are the Euro prices converted to dollars upon purchase? If I missed the KAL mystery clues, can I still make the kit and get the clues after the fact? Yes I do indeed ship to the US (in fact most of my customers are in the US!). When you purchase your credit card company will convert to dollars. If you opt to use paypal then the conversion is done by paypal. At the end of this week I will be releasing the full pattern for the shawl (if you purchase now you’ll get all the clues at once) and the kits are available on my website.